Security is one the basic human needs, so securing your home or business is an important endeavor. The master key system is quickly becoming a thing of the past, as is the act of handing out keys to neighbors or employees and then having to track those keys down when you want them back. The hassle of hiring a mobile locksmith to re-tool locks, keep track of keys, and replace locks when a key goes missing gets old fast. There's a better, more permanent solution for 100% security in your home or business – commercial access control systems. As our world becomes increasingly information technology centered, the need for real security is essential. Imagine having immediate control over who may access your home or business. With an access control system you know and dictate when people come and go, where they were and for how long. Security is simple with complete access control. Access control systems are a modern approach to securing your business while also allowing employees the access they need to do their job. You'll never have to worry about lost or stolen keys again. With real-time access to data like who arrived and who left, where they went in your building, and how long they were in each area, losing sleep over security issues is a thing of the past. 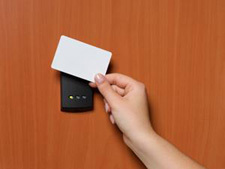 ID cards or PINs are given out to employees, day workers, contractors and visitors, and they can be individually programmed for the unique access required by each person. Part-time or temporary employees can be assigned a limited security clearance, janitors and contractors can be allowed access only to approved sections, and access can be modified anytime or completely restricted after an employee is terminated. If you want a quote for complete access control system installation specifically designed around your unique security needs, Reno Sparks Lock & Safe in Nevada can be contacted at (775) 525-5712 today.